Sometimes it’s easy for us to view the work we do as just another day at The Tutorial Center. But sometimes others remind us of the impact we regularly have on the people we serve. Former YAP! (Youth Agriculture Project) crew members Elyse Hardy and Renette Gonzalez were both featured in the September issue of New England Literacy Resource Center’s magazine The Change Agent. It was the magazine’s “food issue.” Renette and Elyse each wrote about their personal experiences in YAP!, sharing how the program helped them achieve success in the working world. 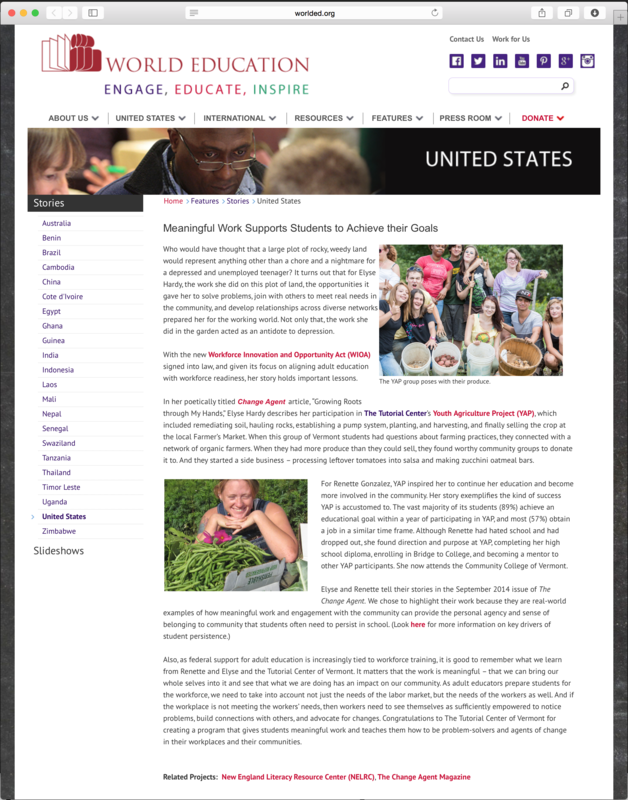 Parts of their stories were more recently included in World Education’s October Newsletter. World Education is a widely-known and well respected global organization whose mission is to raise the quality of lives through education. Tackling such important topics as HIV, poverty, literacy, the organization does on a global scale what we at The Tutorial Center do in our part of the planet. We’re proud and pleased to be included in their network.